The next Super Smash Brothers is one of, if not the most anticipated Wii U/3DS titles for Nintendo fans the world over. 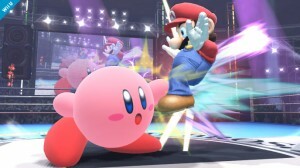 Every Smash Bros that has been released, has seen massive critical success, with Melee representing what many claim to be their favorite fighting game of all time. The announcement trailer at E3 blew us away, and we’ve all been eagerly anticipating any new details on Nintendo’s all star fighter. The game’s director, has been posting a picture a day on Nintendo’s Miiverse, in order to create interest for the game. While the photos shown to the public are always engaging or hilarious, there are a few that do reveal never before seen essentials, in the next Smash Brothers. The last one was an obvious reveal to a Metroid: Other M stage, but today’s picture was a little more suggestive in nature. The picture above is the one in question, and shows off Kirby wielding his signature hammer. Looks normal, right? Well, when you observe the background and the lighting of our little pink friend, the familiar aesthetic of Super Mario Galaxy jumps immediately to mind. 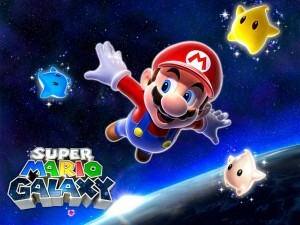 This new pic all but confirms the existence of a new level based on Mario’s wild space-faring adventure. Will we be treated to some wild shooting star antics or some zero gravity shenanigans in the new Super Smash Brothers? Only time will tell…though one thing is for certain. In space, no one can hear you Smash.